The open plan living room is ideal if you are looking to socialize and entertain. Come back from a day on the mountain and cook a large meal for your family or guests. There is a wonderful gas fireplace to warm up the cabin and relax for the evening. This townhome also has a nice cabin feel with it's wood trim, wood vaulted ceilings and radiant floor heat. 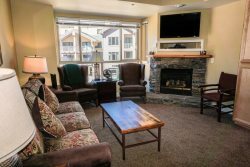 The location of this condo is directly across from the ski mountain chairs 5 & 6. Also adjacent to the meadow where you can snowshoe or cross-country ski to your heart's delight. Full Kitchen with the following amenities- dining table seating for 8, bar seating for 3, dishwasher, gas stove, microwave, coffee maker, basic pots and pans, dishes and silverware. Everything was perfect and worked smoothly!